Building Healthier & Successful People – JOIN Me… ! Inside your body there is an amazing protection mechanism called the immune system. It is designed to defend you against a variety of unfavorable elements that would love to invade your body and compromise your health. For this reason, it is easy to understand that maintaining a healthy immune system means living a healthier life. A Technological Breakthrough to a Complete New Dimension in Nutritional Science::: The Most Exciting Discovery in Immunology and Preventive Healthcare. A Breakthrough in Preventive and Recovery Health Sciences. The Woodland Health Report calls it “The Miracle Molecule” that outsmarts health challenges. The immune system is the key to the proper functioning of every other body system. The daily stresses in our lives and simply living on this planet jeopardize and compromise optimal immune system function. Harmful Chemicals in food Antibiotics, Growth Hormones, Artificial Coloring, Flavoring, Preservatives, Pesticides and Herbicides, Water Pollution e.g. chlorine, chemical treatment residue, sewerage contamination, spill hazards, industrial hazards, bacteria, virus, parasites and fungi. The consequences of daily stresses:::The constant assault of stress, poor diet habit, pesticides, herbicides, chemicals and air and water pollution suppress, impair and weaken our immune system making us more susceptible to sickness and disease. Signs of weakened immune system::: Recurrent or chronic infections, even very mild colds, are signs that the immune system is weakened.Support of the immune system is perhaps the most important step in achieving resistance to disease and reducing susceptibility to colds, flus and cancer.Michael Murray, N.D. and Joseph Pizzorno, N.D. (Encyclopedia of Natural Medicine) Colds, flu & other contagious diseases are a consequence of immune system’s failure to recognize and eradicate these micro organisms. Antibiotic-resistant infections, degenerative disease, cardiovascular disease, cancer, autoimmune disease, diabetes and chronic respiratory conditions can be attributed to a dysfunctional immune system. If these antibiotic-resistant bacteria a.k.a superbugs continue to evolve at the present rate, antibiotics would be of little help. Can antibiotic help. Bacteria resistant to antibiotics are a growing health threat due to the misuse of the drug.Frequent use can cause allergies, damage organs, depression and etc. Richard Besser, M.D., CDC Respiratory Disease Branch At least 70% of the bacteria that caused hospital-acquired infection are resistant to at least one antibiotic… Antibiotics are completely useless against viruses. USA Today, March 11, 1998 issue If these antibiotic-resistant bacteria a.k.a super-bugs continue to evolve at the present rate, antibiotics would be of little help. Ensuring our immune system at its optimal effectiveness is the single most important action we can take to protect ourselves and regain control of our health. What transfer factors are not:::NOT A VITAMIN, MINERAL, HERB, DRUG, HORMONE OR COLOSTRUM. Transfer factors form the core of our immune system’s intelligence. Unlike vitamins, minerals, or herbs that simply add nutrients, these molecules actually transfer immune memory, knowledge, and wisdom. The result is a strong and healthy immune system that knows exactly what to do, when to do it, and how to get it done quickly. Transfer factor has been recognized and endorsed in the United States (U.S.) Physicians Desk Reference, PDR® for Nonprescription Drugs, Dietary Supplements, and Herbs since 2003. Transfer factor has been researched by the Russian Academy of Medical and Technical Science, endorsed and approved by the Russian Ministry of Health for use in hospitals and clinics since 31st July 2004.After ten clinical studies on the effects of transfer factor on cancer, HIV, hepatitis, allergy and more, the Russian Ministry of Health released a 32-page report Methodological Letter to hospitals and doctors encouraging the use of Transfer Factor and Transfer Factor Plus. Transfer factor has 60 YEARS of RESEARCH and more than 3,500 SCIENTIFIC RESEARCH and STUDIES. Transfer Factor Plus increases immune cell effectiveness i.e. the natural killer cell (NK cell) effectiveness up to 800% more powerful than any other known nutritional substance found in any scientific or medical literature. Natural Killer cells (NK cells) eliminate from the body: tumor cells, cancer cells & infected cells and protect the body against a wide variety of infectious microbes:viruses, bacteria, parasites & fungi. Over the years, the independent laboratory, Jeunesse Inc. (Institute of Longevity Medicine) has tested 196 natural products (nutraceuticals). 152 of these products increased NK cell effectiveness from 0 to 10%, the highest was 49%. Furthermore, 49.5% of the products tested were found to be toxic at even the manufacturers recommended dosages. TF Advanced and TF Plus AF increase NK cell effectiveness up to 283% and 437% respectively. They were found to be non-toxic (ZERO toxicity) at dosages a hundred times in excess of the recommended servings. This has proven Transfer Factor to be most powerful, potent and safest product ever, for the immune system. 95% of pathogen that causes sickness and disease enters the body through the mucous membranes surface i.e. mouth, nose, digestive tract, respiratory tract, urinary and genital tracts. IgA antibodies play 3 very important roles in keeping a healthy body. 3. Neutralize these pathogen quickly. The above graph is a four-week study of 4Life Transfer Factor and IgA antibodies on 21 healthy adults, who had never taken any transfer factor products before. To determine the effect of 4Life Transfer Factor on IgA antibodies production, participants took 4Life Transfer Factor Tri-Factor Formula for the first two weeks, and then 4Life Transfer Factor RioVida® Tri-Factor Formula for the following two weeks. The results after four weeks, 100% of participants showed an increase in the production of IgA antibodies within their saliva, with an average increase of 73% when compared to the one week baseline. What’s more, most participants (95%) showed an increase within just two weeks! • Boosts B-cell production of IgA antibodies, increasing the body’s defense against pathogens entering through mucous membranes. • Provides critical protection at one of the most common entry points for potential immune system invaders. • Increases vital antibody protection. Transfer Factor Plus® kills cancer cell up to 97% more than the Interleukin-2 (IL2) drug used as the standard that reach 88%. Transfer Factor Plus® has zero side effects as compared to Interleukin-2 (IL2) drug. The above chart is a study done by the Russian Cancer Research Centre of the Russian Academy of Medical Science. In the study activation, 4Life Transfer Factor Advanced Formula, 4Life Transfer Factor Plus Advanced Formula and Interleukin-2 drug resulted in a kill rate of K562 cancer cells of 69%, 97% and 88% respectively with the 48 hour incubation period giving the greatest NK cell activation. Transfer factor most effectively modulate over-active immune cell (T cell) back to its resting state. Over-activity of immune cells result in autoimmune conditions and allergies. The above chart is based on results from multiple, repeated test conducted by 4Life researchers during 2007 using an FDA approved diagnostic CD4 helper T cell in vitro assay. This test started with helper T cells (T-cells) at rest. A non-harmful, plant-based stimulant was then introduced to the T-cells, resulting in a large increase in T-cell activity known as hypersensitivity response. In this case, the high level of T-cell activity or hypersensitivity response is not necessary because the stimulant is non-harmful. The T-cells are actually in the state of over-activity when they should remain in a state of rest. Different substances were then introduced to the over-active T-cells to see which would bring the T-cells back into healthy balance. Transfer Factor® Tri-Factor™ Formula products most effectively modulate over-active T-cells back to their initial resting state. We do believe an immune system that is at its peak efficiency can be very beneficial. When you are faced with any health challenges it is important to have as much working for you as possible. Diet, exercise, habits, TRANSFER FACTOR nutrition and medical assistance are all important in putting the odds in your favor. Due to 4Life compliance regulation, we have withheld our testimonies. What is your defense against various health challenges in your family, neighborhood, environment and neighboring countries? What is your defense against chemicals, pollution, eating disorders and stress? If there is any defense, it would be your immune system, your first line of defense against the threats and onslaught of health challenges. Health is indeed your most valuable possession. 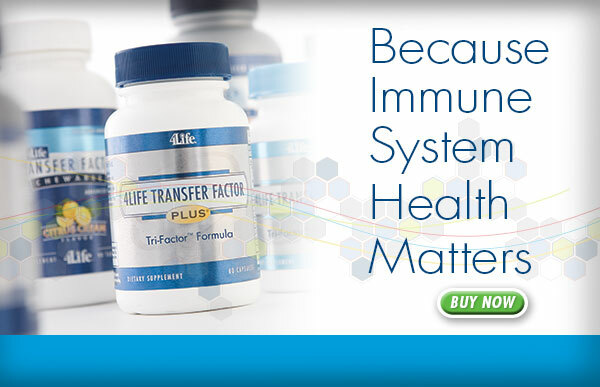 Protect and regain control of your health by creating a really healthy immune system with transfer factor. Now that you know how important your immune system is and how you can optimize your immune system for a “healthier YOU“, take 5 minutes to look at the products available for you (www.4life.com). IF YOU HAVE A NEED FOR A JOB, FOR BETTER HEALTH, FOR BETTER QUALITY OF LIFE, ¨I HAVE THE PERFECT SOLUTION, I CAN PUT IT IN YOUR HANDS¨, IT DOES NOT MATTER WHERE YOU ARE, OR IF YOU HAVE STUDIES OR NOT, IF YOU HAVE A WILL, IF YOU HAVE HOPE, IF YOU WANT AND NEED TO BETTER YOURSELF, CONTACT ME (A.S.A.P. ).